On 22 January 2006, during the grand opening of its Pittsfield Township Office (at 6983 Michigan Avenue, just East of Saline), LaSalle Bank awarded the Pittsfield Township Historical Society with a $10,000 Sustainability Grant. Following are the remarks of Society President, Betty LeClair, as she recieved this generous gift. "LaSalle Bank is the newest member of our business community, but it also is the FIRST business to achieve PATENTEE status within the Historical Society Gifting Categories. "Land Patents were signed by the President of the United States, as land was being transferred from Federal ownership into private hands. In the case of Pittsfield Township, Land Patents were signed by John Quincy Adams and Andrew Jackson. We are delighted to welcome LaSalle Bank as the FIRST BUSINESS Patentee in the township. "This generous gift will be earmarked for restoration work on the historic Sutherland-Wilson Farm, which initially was patented in the late 1820s and was purchased by the Sutherland family in 1832. The farm remained in the Sutherland family for the next 170 years before it was acquired by Pittsfield Charter Township, to be preserved as an historical Farm Museum. The farm museum sits on 4.6 acres of land and consists of a Greek revival home and six outbuildings: a barn (which presently is under restoration), ice house, carriage house, pump house, wood shed and pig pen. "The Society plans to use the funds to restore the East portion of the Sutherland-Wilson House. In the 1950s, that portion of the House was converted into an apartment by Mr. Wilson for his son. The Society plans to restore this area to its original appearance and uses. Most of the house remains much as it appeared when it was built. "As a small gesture of appreciation to LaSalle Bank, the Society will feature this gift for three months on the Societies website homepage, and therefore will feature it in the Sponsors section of the Website. Pittsfieldhistory.org Also, the Society hopes to establish a means of recognizing major gifts by placement of plaques in buildings where the gift proceeds were applied. We will plan to position such a plaque in an appropriate location in the restored East portion of the Sutherland-Wilson House. "If this generous support of the Society is a reflection on how LaSalle Bank will support and serve the residents and businesses of Pittsfield Township, we all will be beneficiaries of their arrival." On behalf of the Society and the community which both the bank and Society serve, welcome to Pittsfield Charter Township. We wish you every success. 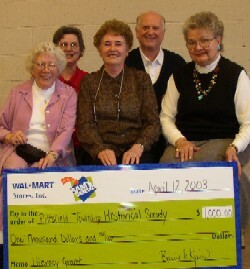 Caption: Members of the Pittsfield Township Historical Society Board with $1000 check from Sams Club. Corporate and personal sponsors are local firms and indivduals that have made generous gifts -- $1000 or more -- to the Pittsfield Township Historical Society.